The Learn and Master Series is top of the range. Other courses offered by Learn and Master are guitar, piano, drums, ballrooms dance, and further guitar study. Learn and Master Painting is a thorough and comprehensive course incorporating a wide variety of materials and quality instruction. The advantage with learning at home is that you are able to work at your own pace but this course also gives you access to an online student community and individual contact with the tutor via a discussion board. All this is designed to provide the best quality learning experience for the beginners learning to paint. Learn and Master Painting teaches the techniques for oils, acrylics and water-mixable oils. The course focuses on painting and little or no drawing experience is needed, though more advanced painting students will still benefit from the techniques learned here. The detail involved in the course is immense, ranging through setting up a work space through color theory, composition, subject, paint techniques, varnishing your finished painting and getting involved with your local art community. The video instruction is slow and clear and of a high production quality. The teacher has a calm friendly manner, and this enables you to become absorbed with what she is telling you and follow the instructions step by step. There is nothing worse than having information presented by an irritating person, but Gayle Levée successfully brings a joy to the process while remaining in the background, so to speak. This makes it easier for you to go back over steps and repeat them to improve your technique without the distraction of poor presentation. This is the whole point of having a course on a DVD, so five stars to Learn and Master Painting. So, what do you actually get for your cash? On top of the 20 instructional DVDs there is a lesson book covering all the course information. This means you can use it as a reference book if you need to find information quickly, and also become a further learning aid by way of textual format. The best way to learn is by repetition, and to have things in visual and written format really helps. This course has been really carefully thought out and we have awarded good points for teaching effectiveness. You also get 3 music CDs offering a variety of music to listen to while you paint. As well as being a fun and relaxing tool, the music will help get you in the frame of mind for creative learning when you reach for your paint brush. At No1Reviews.com we like this innovative approach. Costing $249, it is certainly an investment but in this case well worth making in terms of quality, learning experience and value for money. Questions for Gayle Levée? Gayle will personally respond to your questions as she is available. Who are you? Where are you from? How has your painting improved? Questions about Learn and Master Painting Content. Upload pictures of your artwork to share with fellow students or for critique. Any painting or art discussion welcome. Frequently Asked Questions. Search here for answers to common painting questions. Suggested resources for buying paints, supplies, equipment, etc., related to your art. Comments and suggestions - Painting. 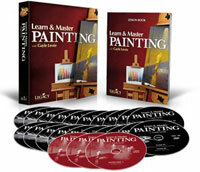 Comments and Suggestions specifically regarding the Learn and Master Painting course. "I owe you Gayle... I keep meaning to let you know how grateful I am to have found this course... I feel like all the gaps of my art education are being filled... Baby oil to clean up my hands? Ingenious!... Creating black - wow! What a difference to my darks... Toning with the perfect complement the FIRST time thanks to thorough color theory - amazing!... Just 6, perfect brushes - Easy!... Gayle, you are slowly but surely enabling me to do something I've longed to do: label myself as an "artist"... I think I'm gonna cry!... Thank you, thank you, thank you!... Sally (your "Highness") from Florida". Are oil paints more difficult than water-based paints? If you cannot find what you are looking for here, or in the reference section or other pages then you can write to tutor, Gayle, and ask her yourself. The forum appears to be regularly updated and a positive place to share your learning experiences. This is certainly the best forum accompanying a product in this category. Tutor, Gayle Levée is a professional exhibiting artist and her work can be seen at GayleLevee.com. It is quite important that you like the work of the artist who is going to be teaching you, so check it out first. Levée's work has been well exhibited and she also runs art classes in Nashville throughout the year. These cover special topics such as Painting Outdoors and How to Paint Brilliant Florals. Learn and Master Painting comes out top for No1Reviews.com. Costing $249, it is certainly an investment but in this case well worth making in terms of quality, learning experience and value for money. This course is suitable for beginners because it is accessible and fun, but will also benefit the more experienced artist because of its comprehensive content and excellent online support. This product is simply too good to be missed.